RUMORS OF CYBER WAR: President Obama’s State of the Union Address included this hidden stock tip: invest in cyber-security companies with government contracts. 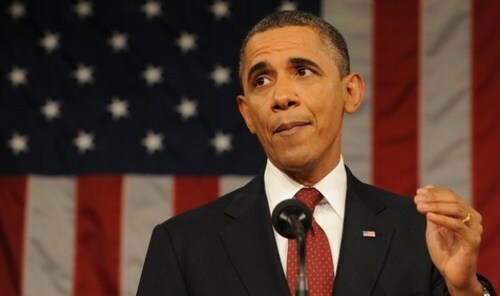 WASHINGTON, D.C— Speaking to the nation during his 2013 State of the Union address in February, President Barack Obama used the spotlight to warn of the growing threat posed by attacks in cyberspace. Announcement of new spending to defend against cyber attacks was supported by more official drum beating. “There’s a strong likelihood that the next Pearl Harbor that we confront could very well be a cyber attack,” warned Leon Panetta, former Secretary of Defense and director of the CIA for the Obama administration, in Jan. 2012. 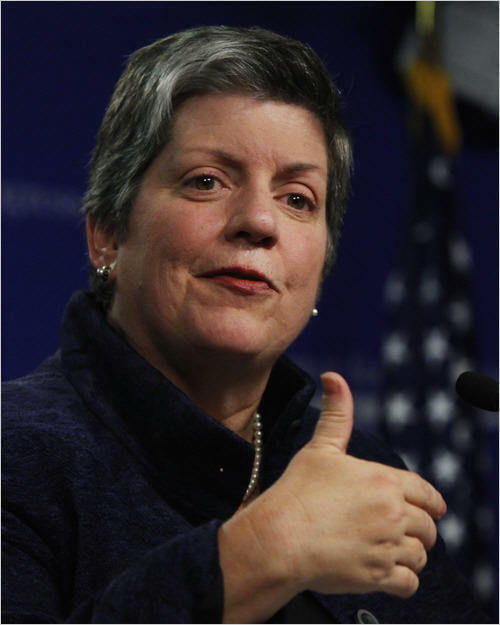 NOT EFFICIENT: Secretary of Homeland Security Janet Napolitano is admittedly not keen to adapt technology. On Mar. 7, Secretary of Homeland Security Janet Napolitano, a self-described “luddite” who refuses to use email because it’s “inefficient,” testified before theSenate Homeland Security Committee that “sophisticated threats” posed great danger to the “nation’s critical Internet infrastructure,” and more cooperation with “private sector Internet partners” was needed to ward off attacks. While the administration’s push for a cybersecurity agenda has been met with praise among officials and industry leaders, it’s unclear just how costly — for businesses and taxpayers alike — such a plan will be. Hypothetical “9/11-Pearl Harbor-sized attacks” have received regular mention in House and Senate testimony, serving as the justification for current bills such as the Cybersecurity Enhancement Act and the Cyber Intelligence Sharing and Protect Act, or CIPSA, the latest version of the Stop Online Piracy Act and Protect Intellectual Property Act, which both failed after a public uproar in 2012. It’s a threat the government deems serious enough to hire more than 10,000 “cyber warriors” in the near future, according to the Cyber Security Challenge, a public-private contest created to hire the next generation of cybersecurity experts. RECRUIT: The Cyber Challenge aims to hire 10,000 new “cyber warriors” in the near future. And it’s a focus that already consumes billions of dollars in taxpayer dollars each year. In 2011, the federal government spent over $13 billion on cybersecurity, all but $3 billion of that from the Department of Defense, according to a recent report by the DOD’s Cyber Threat Task Force. SKEPTICAL: Gattuso sees no role for the government in regulating cybersecurity. Gattuso recognizes the importance of cybersecurity, but maintains government regulations will only burden American businesses even more, putting their bottom line at risk in the face of unproven claims. He maintained that businesses have the ultimate market incentive to protect themselves against attacks, and won’t need costly regulations to do so, a point supported by the latest research. According to the latest report by IDC Financial Insights, a market research firm in Framingham, Mass., global cybersecurity spending is estimated to exceed $80 billion by 2017, averaging 16 percent of all tech spending by private firms. Even without government regulations, these companies are spending an average of 5.5 percent more on cybersecurity each year, according to the study, demonstrating an active role by business in protecting their own systems, something Gattuso believes the government won’t be able to provide. So far, the only use of a major cyber weapon worldwide came from the United States itself: the federal government’s reported release of the Stuxnet worm, a highly sophisticated malware program designed to cause damage to Iran’s nuclear facilities. WEAPON: The U.S. government reportedly released the Stuxnet virus to attack Iran’s nuclear facilities. Release of the worm was uncovered by the New York Times in June 2012, but the government has never publicly acknowledged ordering the attack. According to statistics gathered by the Washington Post, 513 different consultants and companies lobbied Congress on issues of cybersecurity in 2012, an 85 percent increase from the previous year. DANGER: Tien says involving the government in internet security puts privacy at risk. He sees the current solutions as inherently problematic, especially considering the role of the would-be regulators and industry lobbyists in Washington, D.C. He sees the potential for taxpayer abuse if things go too far. And Tien is not alone in his skepticism. It is no accident, therefore, that the 10 largest U.S. defense contractors each have their own cybersecurity offices—a fact well known on Wall Street. He recommends buying stock in companies such as Symantec, an Internet security firm,and Raytheon, the nation’s fourth-largest defense contractor and the world’s largest producer of guided missiles, according to its website. In 2011, Raytheon made $24.8 billion in total revenue, $23.4 billion of which came directly from military contracts—over 93 percent, according to an analysis by Defense News. It spent $7.5 million lobbying Congress in 2012, according to the Center for Responsive Politics, and has upped its commitment to meet the government’s cybersecurity needs. 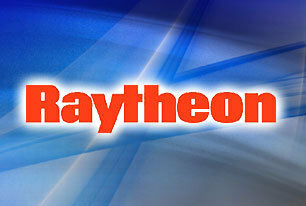 CASHOUT: Raytheon has been identified as a major player in the cybersecurity industry. “Information sharing and collaboration between government and industry partners is critical to defending our nation against the cyber threat,” proclaimed Raytheon vice president Steven K. Hawkins in a press release last month. U.S. Sen. Thomas Carper, D-Del., author of the Cybersecurity Act of 2012, owns anywhere between $1,000 and $15,000 in Raytheon company stock, according to his 2011 financial disclosure form. The board of directors hosts powerful political and military players, including former U.S. Sen. Warren Rudman, R-New Hamp., former U.S. Deputy Secretary of Defense John Deutch, and former Chief of Naval Operations Vernon Clark. Calls to Raytheon’s press office were not returned. As the experts contend, it is not so much about questioning a threat, but it is about if the incentive already exists for companies to privately deal with those threats, without the hand of government. Contact Yaël at yael@ossowski.ca and follow him on Twitter @YaelOss.